Pest Expert Mouse Glue Traps / Mouse Glue Boards are a professional-standard product guaranteed to deliver fast and effective rodent control, particularly useful in situations where other methods have failed or are unsuitable. Considered by many professional pest control technicians to be the best available on the market, Pest Experts Glue Traps should not be confused with the many poor quality, imported glue traps with weak adhesive which fail to trap. Pest Expert Mouse Glue Traps / Mouse Glue Boards provide a fast and effective method of rodent control, particularly useful in situations where other methods have either failed or are not suitable. Made with an extra strong adhesive to ensure effective trapping. These professional standard glue traps measure 22 x 14cm, making them larger than most mouse glue traps on the market and allowing multi-catch potential from a single board. Unlike other control methods, which rely upon rodents taking bait, mouse glue boards simply trap mice as they run over the board, becoming stuck to the extra-strong adhesive. Mouse Glue Traps are widely used by professional pest controllers, although generally considered to be a last resort method for dealing with rodent infestations. As they are un-baited, glue traps are ideal for situations where mice have an alternate food source hampering control efforts using poison, for example, restaurants, bakeries, shops and food processing plants. The virtually non-drying adhesive means that these glue traps can remain effective for months in normal conditions. Upon discovery of a caught mouse or rat, please be sure to dispatch captured rodents as quickly and humanely as possible. 1. All other options for rodent control must be considered before glue traps are used. 2. Carefully peel off the backing paper, being careful not touch the adhesive. 3. Place glue traps about 2-3 metres apart in areas where mouse activity has been noticed. For best results, lay flat against walls, along rodent runs and near potential points of entry. 4. DO NOT bait the traps as this may have a negative effect. 5. Glue traps are not suitable for use in damp conditions or in very low temperatures. 6. Glue traps MUST BE inspected every 12 hours. Remove boards if inspection cannot be carried out at these intervals. 7. Captured rodents must be dispatched quickly and humanely. Drowning IS NOT acceptable. 8. DO NOT use outdoors or in areas where there is a risk of trapping non-target species. 9. In the event of accidental trapping of a non-target animal, a food grade oil or similar emollient can be applied to aid release at the site of capture, providing the animal is unharmed and its release is not prohibited by law. 10. Glue boards should be disposed of with the adhesive surface covered and in accordance with local authority waste requirements. 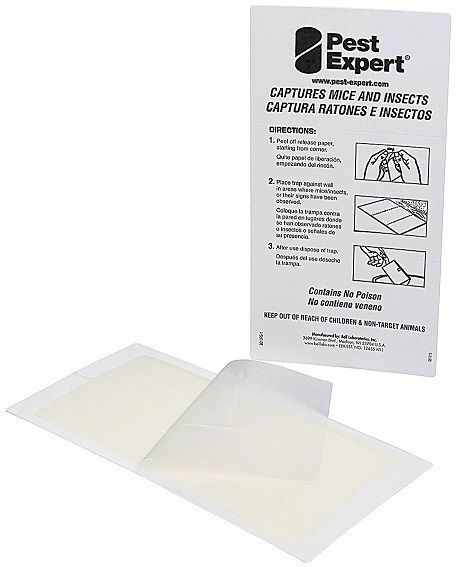 Pest Expert Mouse Glue Traps provide a fast and effective last resort method of eradicating mice from your home or business, preventing mouse populations from increasing and spreading disease. These professional-standard glue boards will deliver rapid results where poison and traps have failed. In addition, glue traps allow for complete control over the disposal of the body, eliminating nasty odours from decomposing carcasses. Ideal for use in poison-sensitive environments and in instances of repeat infestation or resistance to rodenticide. Perfect for both domestic and commercial use, including in restaurants and other food premises where alternative food sources may hamper control using rodenticide. Pest Expert Mouse Glue Traps are ready to use and require no baiting. Fantastic - they work quickly! Fabulous service - quick and efficient! Tried mouse bait but were just feeding the mice got these and results in hours - great product. Would definitely recommend getting these ... thank you! Excellent ........ every board caught 1 or 2 mice. Excellent. It really works caught a mouse immediately! TOP DRAW. Excellent product caught 4 first night, outstanding service delivered next day. Keep up the good work, its hard to find good customer service these days. Definitely recommend. Perfect. Quick delivery. Caught 2 mice within hours. Best yet. These are very good, You quickly realise how bad the situation is when you get several at one time! Brillant. Great works well best yet, good service very quick. Worked Everytime. Got the boards speedily enough and set them to work in an old farm house. Effective every time, with easy set up with some Nutella (other spreads are available) and fantastic success in removing a mice presence. Now winter is returning, the little pests may attempt to re-populate said house, so this was my first port of call. Good product! We were getting a lot of visits from the little ones so got this and after three times using those buggers stopped coming! Boards are very sticky and certainly do trap mice well. The boards need to be moved regularly until one is caught. Effective sticky board. The best way off wiping out mice population!! Quality product - better to pay up and catch the mice, mice easily escape from the cheaper makes..these boards work! !